Xanadu was the summer capital of Kublai Khan‘s Yuan Dynasty in China, before he decided to move the seat of his dynasty to the Jin Dynasty capital of Zhōngdū, which he renamed Dàdū, the present-day Beijing. Xanadu was visited by the Venetian traveler Marco Polo in about 1275, and in 1797 inspired a famous poem, Kubla Khan, by one of the leading English poets of the Romanticism movement, Samuel Taylor Coleridge. Xanadu was located in what is now called Inner Mongolia, 350 kilometres (220 mi) north of Beijing, about 28 kilometres (17 mi) northwest of the modern town of Duolun. The layout of the capital is roughly square shaped with sides of about 2,200m; it consists of an “Outer City”, and an “Inner City” in the southeast of the capital which has also roughly a square layout with sides about 1,400m, and the palace, where Kublai Khan stayed in summer. The palace has sides of roughly 550m, covering an area of around 40% the size of the Forbidden City in Beijing. The most visible modern-day remnants are the earthen walls though there is also a ground-level, circular brick platform in the centre of the inner enclosure. The city, originally named Kaiping, was designed by Chinese architect Liu Bingzhong from 1252 to 1256, and Liu implemented a “profoundly Chinese scheme for the city’s architecture.” In 1264 it was renamed Shangdu. At its zenith, over 100,000 people lived within its walls. In 1369 Shangdu was occupied by the Ming army and put to the torch. The last reigning Khan, Toghun Temür, fled the city. Today, only ruins remain, surrounded by a grassy mound that was once the city walls. Since 2002, restoration effort has been undertaken. 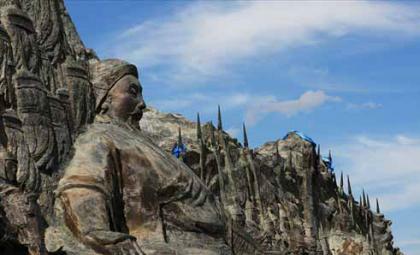 In June 2012, Xanadu was made a World Heritage Site. ” And when you have ridden three days from the city last mentioned, between north-east and north, you come to a city called Chandu, which was built by the Khan now reigning. There is at this place a very fine marble Palace, the rooms of which are all gilt and painted with figures of men and beasts and birds, and with a variety of trees and flowers, all executed with such exquisite art that you regard them with delight and astonishment. Round this Palace a wall is built, inclosing a compass of 16 miles, and inside the Park there are fountains and rivers and brooks, and beautiful meadows, with all kinds of wild animals (excluding such as are of ferocious nature), which the Emperor has procured and placed there to supply food for his gerfalcons and hawks, which he keeps there in mew. Of these there are more than 200 gerfalcons alone, without reckoning the other hawks. The Khan himself goes every week to see his birds sitting in mew, and sometimes he rides through the park with a leopard behind him on his horse’s croup; and then if he sees any animal that takes his fancy, he slips his leopard at it, and the game when taken is made over to feed the hawks in mew. This he does for diversion. Moreover [at a spot in the Park where there is a charming wood] he has another Palace built of cane, of which I must give you a description. It is gilt all over, and most elaborately finished inside. [It is stayed on gilt and lacquered columns, on each of which is a dragon all gilt, the tail of which is attached to the column whilst the head supports the architrave, and the claws likewise are stretched out right and left to support the architrave.] The roof, like the rest, is formed of canes, covered with a varnish so strong and excellent that no amount of rain will rot them. These canes are a good 3 palms in girth, and from 10 to 15 paces in length. [They are cut across at each knot, and then the pieces are split so as to form from each two hollow tiles, and with these the house is roofed; only every such tile of cane has to be nailed down to prevent the wind from lifting it.] In short, the whole Palace is built of these canes, which (I may mention) serve also for a great variety of other useful purposes. The construction of the Palace is so devised that it can be taken down and put up again with great celerity; and it can all be taken to pieces and removed whithersoever the Emperor may command. When erected, it is braced [against mishaps from the wind] by more than 200 cords of silk. Read more at Wikipedia Xanadu .